When randomly picking a book off the shelves of Borders without knowing anything about it or the author, there are a few general rules you should follow. First, if the largest print on the book say "Sequel to Hugo-award winning ________," then you know this book is a piece of crap. The author was spent from the previous novel, and wants to cash in on the success of the first book. Secondly, if there is a quote by Stephen King at the top that says, "Wilson is one hell of a story-teller," run away. While I think King is a great story-teller, this logic doesn't hold true. The wall is white, the cat is white, the cat is a wall doesn't work here. If King would have said "This book is fantastic," then perhaps it might have been a little more convincing. And lastly, if the other "rave reviews" on the cover for the author are from newspapers such as "Denver Independent express," or "Bay City High School student weekly," then you should save yourself 7 dollars, and put the book down. 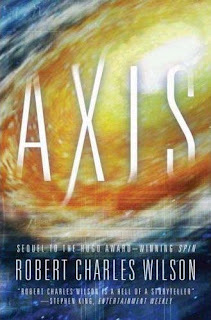 Granted, Wilson is one of the better Sci-fi writers around today. Unfortunately, Sci-fi fiction is kind of like black coffee--an acquired taste. I generally like tons of cream and sugar with my Sci-fi. That being said, I rarely put a book down for poor quality, and always have an open mind going into a read. The premise of the first book in this series (Spin--Hugo award winning!!) was that some ancient (millions or billions of years) things in space termed--Hypotheticals--put a sort of shield on the earth, and fast-forwarded the rest of the universe millions of years. In the time it took you to take a dump, 2 million years would have passed in the mean-time. I wished this phenomenon could take place at work. I'd never leave the stall. And wow, did the world change. A giant Arc was formed in the Indian Ocean, wherein you could travel to another planet millions of light years away. This planet was now being inhabited. And this planet (Equatoria) was the setting for the book "Axis." The story follows a heroine (Lise Adams) and her long-lost swoon Turk Finley. Lise's father mysteriously disappeared years before after studying an illegal but popular way of life called "fourth." In effect, the Martians (oh yeah...did I mention that in the "spin," that Mars had been terraformed, and now life was flourishing there??) had a way to extend life an additional 30 years or so. Lise and Turk travel Equatoria in hopes to find more details about her fathers disappearance. In the search, they run across other "fourths," a dangerous government genome agency, and a young boy who was created to communicate with the "hypotheticals." Let's stop right here. If you were able to finish this last paragraph, then you MAY be able to read this book. If you yawned and skipped to the end, then I suggest you stick to something with a little more "pop." In the end, there are cataclysmic events, and yet the author seems to make these and every other event in the book--boring. Very little tension or suspense is built in this story, and the ending would be considered a let-down if the book hadn't been so dry up to that point. I believe this is the "middle" book of a trilogy, and thus there was no true "ending." No excuse. All in all, I would rate this as a "do not read." If you're a huge Sci-fi fan, or found "Spin" terribly exciting, then perhaps this will interest you.